If just 42% of marketers say their content is effective, what are we doing about it? Today was a great opportunity to watch 1,700 marketers obediently walk, clap and tweet on demand. Skilfully managed by Joe Pulizzi's Content Marketing World team we showed respect to the world's content mega stars, (over) ate our boxed lunches and kindly cross-promoted each other. Some showbiz fairy dust, a bunch of speakers with a lot of self-belief, and some clever clever conference planning have so far delivered a very impressive event in Cleveland, Ohio (who knew?). It's impressive as logistical undertaking, let alone a font of content knowledge like no other. It's also impressive in it's ability to remind me of this: we are all just people. Whether a content marketing rockstar, real rockstar or humble content marketing neophyte we respond to certain things in certain (often predictable) ways. Energy, passion and humour move us. Next year I think we need to send a plane load of Australian financial services marketers and their agencies. I'm not saying we lack energy, passion and humour…I'm just saying we could use more of them in the work we serve up to industry and consumer audiences. Ann Handley (@marketingprofs) said it best when talking about innovation, so here's a snapshot of her session. Too few of us are focussed on helping versus selling. Our content isn't inspiring, and we're not innovating. If fortune favours the bold, we'd better get bolder. That's the nutshell version for our industry, but here's a little more. What's innovative? Innovative doesn't equal cool, odd, a billion dollar budget, a global brand, or a situation monitoring room (think Oreo in the SuperBowl blackout). "Innovation is often the act of taking what worked over there and using it over here", quoted Ann. 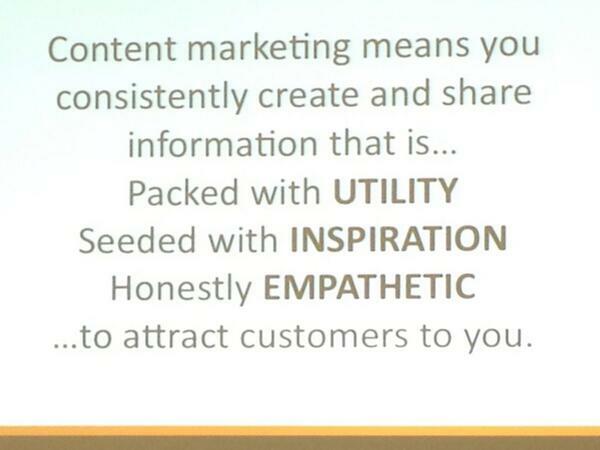 And her definition of content marketing? 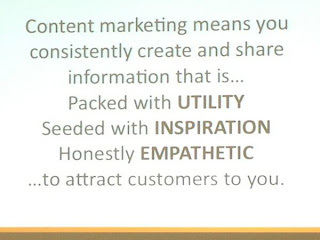 "Content marketing means you consistently create and share information that is...packed with utility, seeded with inspiration, honestly empathetic...to attract customers to you." "Empathy is not what you do, but what you do for your customers." "Useful x enjoyable x inspired = innovative content"
"Experiment, especially when looking to build brand momentum"
I can hear the screams of anguish from here - often brand guidelines, senior management and even our audiences don't permit us to be as energetic, innovative or passionate as often as we'd like. Sometimes, freedom is in the mind. Sometimes the box we put ourselves in is the hardest one to get out of. Sometimes the boundaries are of our own making. So my enduring question after today is this: are we boxing ourselves into smaller creative and strategic spaces more than we need to? OK it's a leading question. Obviously I think the answer is yes. There's a time and place for smart bravery. It's here, and now, is today's CMI take-home.